The news just keeps getting worse for Donald Trump’s favorite television network. Over the past three months Fox News has been thrashed in the Nielsen ratings by MSNBC, particularly by Rachel Maddow who has topped her competition, Sean Hannity, almost every night since the November midterm election. Tucker Carlson’s flagrant white nationalism has become a staple of his nightly program. It’s unconscionable that any advertisers continue to support him. But the exodus of ads has definitely proven to be more than a temporary setback. Carlson is currently is running about half of the ads he had prior to the boycott. And they have been replaced by unpaid Fox promos and public service announcements. Laura Ingraham’s problems began after she attacked the survivors of the Parkland, Florida high school shooting. These are kids who suffered a nightmare that no one should ever face, but who Ingraham considered fair game for even more abuse. She is also notorious for her racist and elitist views, such as when she said that basketball legend and philanthropist LeBron James should “shut up and dribble.” Now her advertisers have also been cut in half. Fox News is standing behind their repugnant hosts. They insist that they will not be bullied by lefties like Media Matters and Sleeping Giants. What’s more, they contend that they haven’t lost any revenue as a result of these boycotts because the ads were merely “shifted to other dayparts.” That’s an outright lie. It would mean that the other programs had unsold ad inventory that these ads could be slipped into. But even if they do, that means they still lost money because they were only replacing one ad for another. Additionally, an ad in primetime costs much more than other dayparts, so such shifting would require those ads to be discounted. And that’s not all. With MSNBC taking the number one spot in most of the primetime cable news market, Fox News would have to lower their ad rates because advertisers aren’t going pay a premium for a number two network. 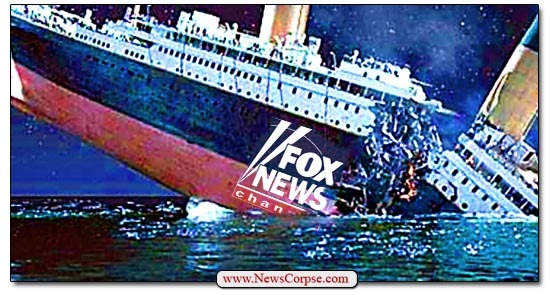 And with that change in leadership comes an even bigger problem for Fox. Like every cable channel, Fox News makes most of its profits through licensing fees from cable system operators. They currently have a very lucrative contract that was negotiated at the height of their ratings success. Now that they are no longer the leader, those contracts will decline in value when they are up for renewal. All of this is due to Fox’s determination to advance a radical right-wing agenda and to serve as the State TV mouthpiece for Donald Trump. It’s an unsustainable business model as the nation wakes up from its temporary lapse in judgement and rejects Trump and the sycophantic, cult-like GOP that he commandeered. The midterm election that produced a historic shift in party control in the House of Representatives was just the beginning. And as the legal consequences of Trump’s criminal and treasonous activities unfold, Fox is going to find itself in ever deeper trenches of muck. That’s surely not going boost their bottom line.